On Monday, Maovember 2017 topped its goal of one million mao and then officially wrapped up its campaign with a rowdy closing bash at Paddy O’Shea’s on Thursday night—full report to come. But for those who still want to contribute, there are three “hair of the dog” events this weekend to help buy much-needed equipment for Bread of Life and The Library Project. Every year, a sleigh full of people dress as Santa and do a day-long tour of Beijing that includes bars, restaurants and cafes. 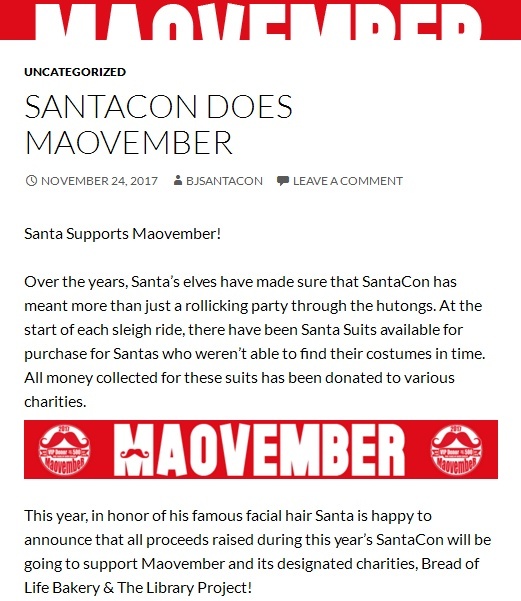 Get into the spirit for this year’s SantaCon on December 2, with funds raised will be donated to Maovember. The Santas will gather at The Local at 11:30 and then head out from there. (Santa outfits are available for purchase.) See here for more details. 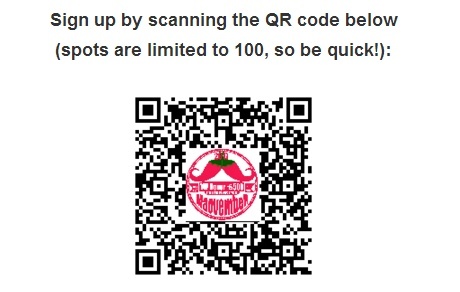 Get ready to say zai jian to your five-week old mustache with the Maovember Shave Off at The Hatchery. 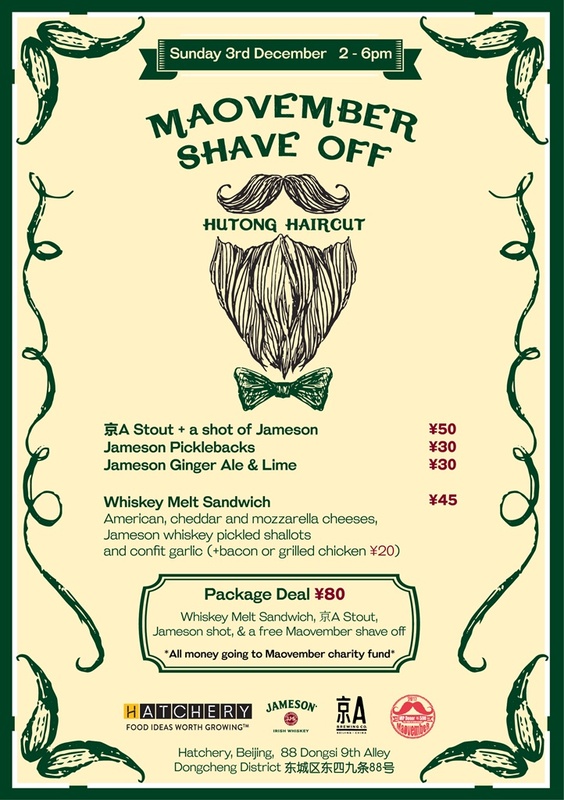 Get a shave, a whiskey melt sandwich, a Jing-A stout and a shot of Jameson for just rmb80, all funds to Maovember! The Hatchery is also donating proceeds from Jameson picklebacks, Jameson Ginger Ale & Lemon, and Jing-A and Jameson combos. 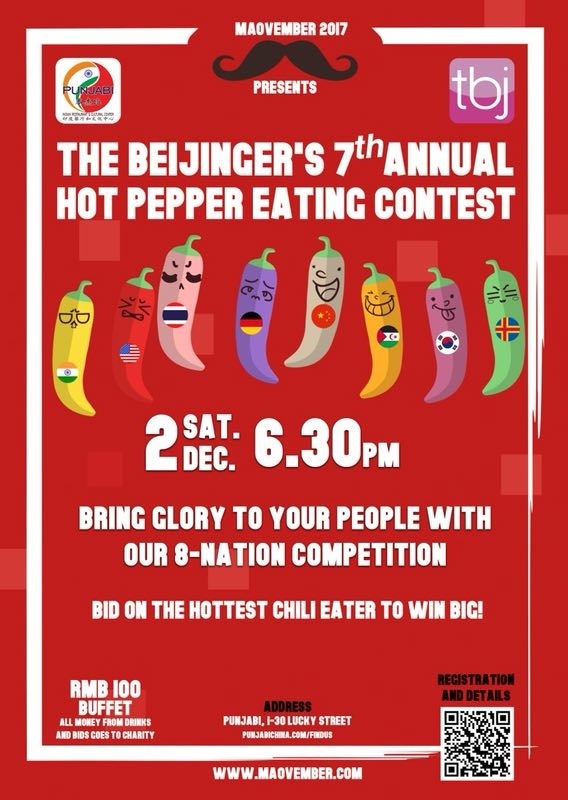 This event will unofficially wrap up the Maovember 2017 campaign so come out for one last celebration of a successful month of fundraising! Thanks again to everyone who has already attended this year’s events and hope to see you a few more times before we wrap up Maovember 2017!